Restaurant Review: Hofbrauhaus - Newport, KY | The Food Hussy! This post is sponsored by Hofbrauhaus. All opinions are my own. 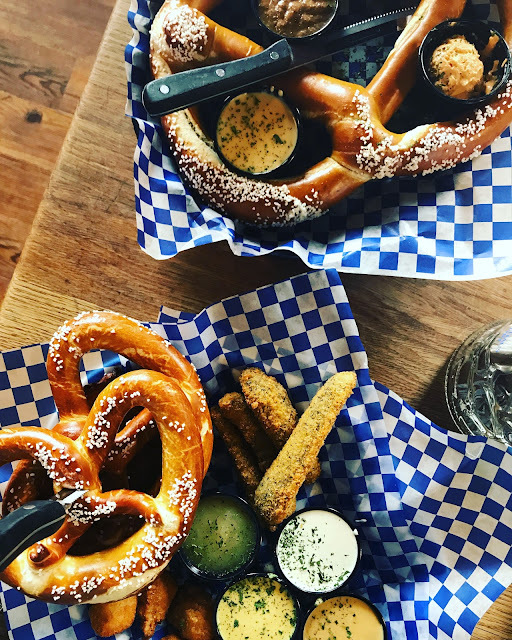 They're best known for beer, pretzels and a good time - which are all reality. 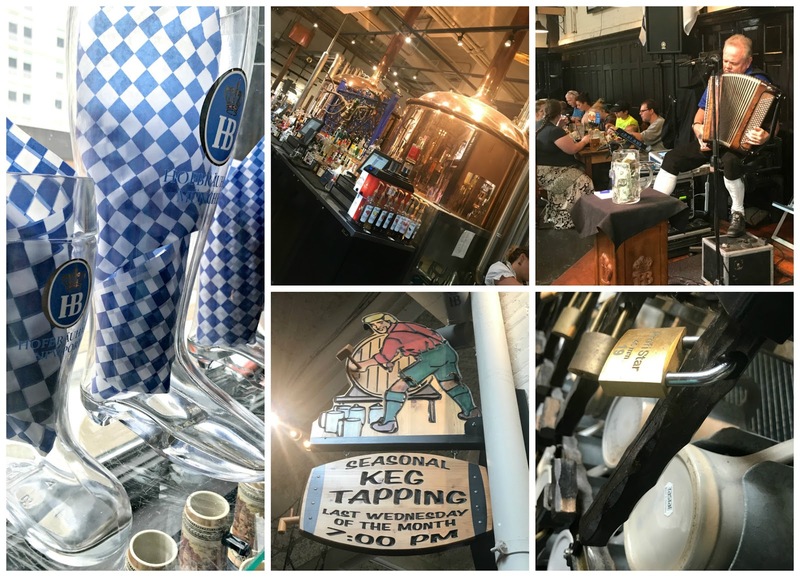 Beyond that - there are German specialties, unique craft brewed beers and a really fun family spot. My friend Steph was with us and she said she's there at least once a week and her whole family loves it! 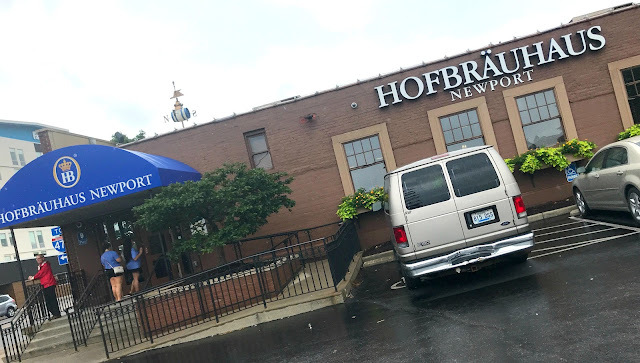 Hofbrauhaus is right across from the new hotel development on Newport on the Levee. They have a large parking lot and an even larger restaurant and beer garden. You'll really be surprised when you head inside at how large it is! There's the main room with picnic tables, the bar and the stage but then there's a separate room that's still huge, but not as loud - as well as the outdoor area. 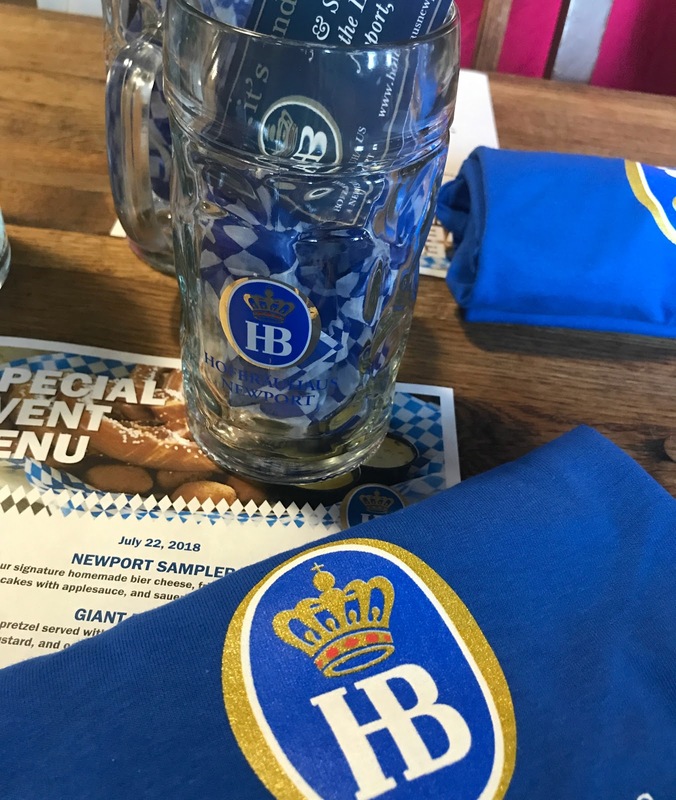 We were invited for a special tasting and given t-shirts, beer mugs and a gift card to giveaway! (That'll be on Facebook soon!!). I pretty much think of it as beer, schnitzel and pretzels - so I was excited to see what all they had to offer! 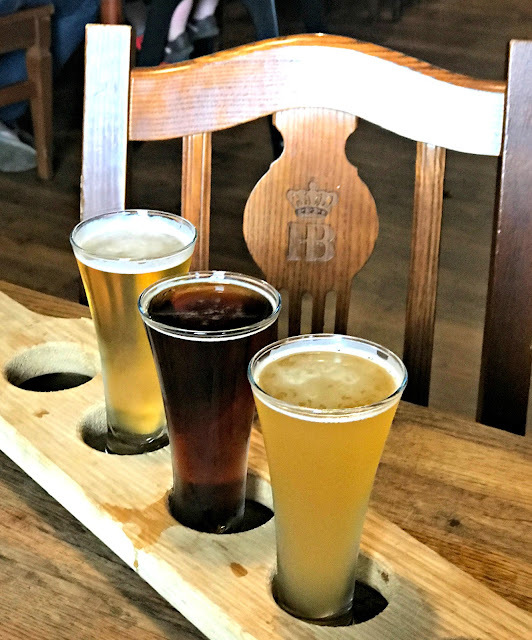 None of us are big beer drinkers - so we asked for mini flights of some of their specialty fruity beers - everybody's favorite was the Pineapple - soooo good! I could definitely get behind that one! 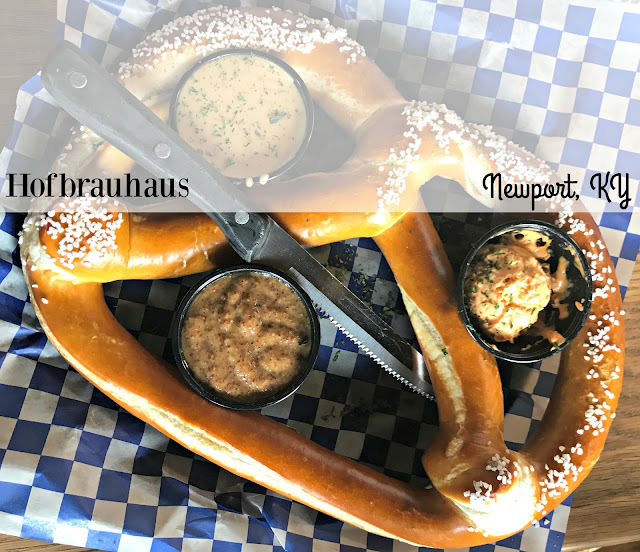 They also brought out a couple appetizers for us - the one was their Giant Pretzel Combo (top - $10.49) which came with "Obatzda" Cheese, Sweet Bavarian Mustard and their signature homemade Bier Cheese. The other was the "Newport" Sampler (bottom - $15.99) with pretzels & bier cheese, fried pickles with ranch, potato pancakes with applesauce and sauerkraut balls with honey mustard. Everybody loved the pretzels - of course - they're soft and salt and delicious. The outside is crunchy, the inside warm and soft. I think my next favorite were the sauerkraut balls but, frankly, there weren't enough of them! There were not even five of them in the sampler so everybody could try one and they're super small. We liked the bier cheese and honey mustard the best of the sauces. There are also a lot of events at Hofbrauhaus and fun things happening. They have a beer stein club where you can lock your mug up and you get free biers with it, there's usually a live musician there jammin with some polka tunes, a seasonal keg tasting every month and a nice little shop where you can pick up t-shirts, trinkets or a big glass bier boot! 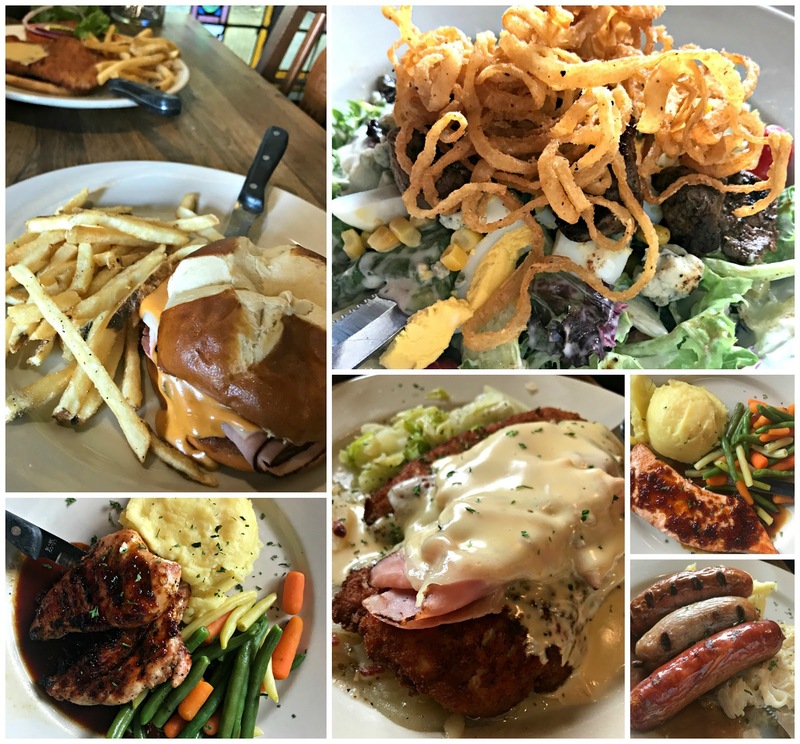 Everybody had their favorite - I think the one that surprised us was the Black & Bleu Salad - it's the least German thing we had and everybody loved it! It was light, the steak was cooked perfectly and it had lots of delicious toppings. Why Should You Go? I think it's definitely some place we should all revisit. Cincinnati has such a beer heritage and for them to choose us for their first US location was a big honor. And while you're there - try that pineapple beer! Be sure to follow me on Facebook and watch for my giveaway!